TRENTON, New Jersey -- Deivi Grullon didn't hesitate when asked about what fueled him on Tuesday night. He pointed a finger into the sky over Arm & Hammer Park and touched his shiny new belt. "My energy is in my father," he said. "This was for my father." The Phillies catching prospect surged ahead in the final two minutes of the championship round Tuesday to edge Rockies No. 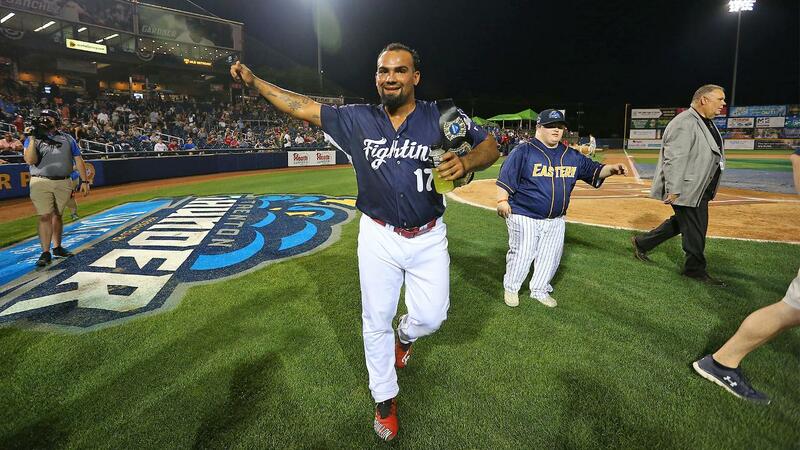 10 prospect Sam Hilliard and win the Eastern League All-Star Home Run Derby at Arm & Hammer Park. Grullon cracked 10 homers in the final round and 24 overall, just enough to edge Hillard, who smacked nine in the head-to-head showdown. "I feel great, I feel great," Grullon said. "It's the second All-Star Game for me. We're gonna play hard and come back here [tomorrow]." The 22-year-old from the Dominican Republic set a noticeably quicker pace in the first round, pumping out dozens of corkscrew swings and producing 14 homers in the four-minute opening set. Each batter had four minutes to swing for the fences, with one water break included. Hilliard finished second in the first round with 13 long balls, edging Pirates No. 16 prospect Will Craig of Altoona and hometown favorite Trey Amburgey of Trenton, both of whom hit a dozen. Harrisburg's Taylor Gushue belted six, while Akron's Connor Marabell hit five off his father, Scott. Reading's Zach Green launched seven and Richmond's Luigi Rodriguez, the first batter to swing, finished with two. Grullon leads all Eastern League catchers and is tied for sixth in the league with 12 homers. He was a Florida State League All-Star last year with Class A Advanced Clearwater. The 6-foot-1 backstop hit six in the first two minutes of the opening round before taking a quick break and catching fire late. "It was tiring, yeah," he said, pointing to the sky again. "I was blessed with this moment. I had a lot of energy here with all the players. This was for my father. I'm tired, but I won this Home Run Derby." Grullon said his dad died in 2012 around the time he agreed to a contract with the Phillies. "I just thought of my father and put some balls in the air and that's it," he said. Hilliard, a 2015 15th-round pick out of Wichita State, hit a ball into that appeared to reach the Delaware River beyond the right field wall. He swapped batting gloves during his break in the first round before building a commanding lead. In the final, most of his homers came after a slow start. Was Grullon nervous as the clock ticked and he remained behind? Grullon was presented with a gold wrestling-style championship belt and a large pork roll. Pork roll, also known as Taylor ham, is produced in New Jersey. Asked whether he'd share the treat with his teammates, he laughed and said yes. "I'll put [the belt] in my home and show my family," he added.